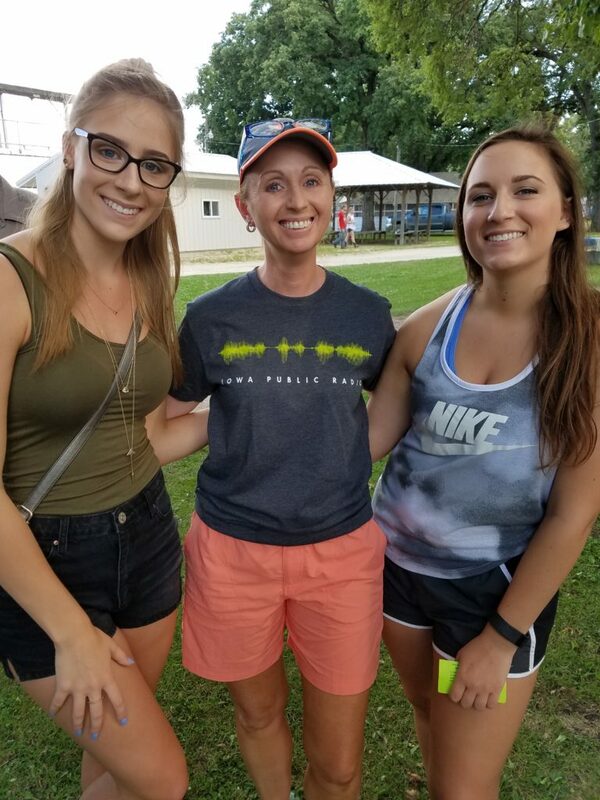 Last Sunday we were once again able to attend the Chickasaw County 4-H Fair. This is a time where 4-H’ers are judged and can share their experiences, projects, and livestock with the community. It is a 4-5 day event that takes place in Nashua, Iowa at the Chickasaw county fair grounds. 4-H provides youth access to safe learning environments; challenging experiences that build skills, competencies, and resiliency to address life’s challenges and to actively contribute to society; and partnerships with caring adults to help meet youths’ basic needs of belonging, mastery, independence, and generosity. We have attended this for many years because our closes friends have children that participate in this. As we all get older, we are down to to just one girl, Jessica, who is still in 4-h. 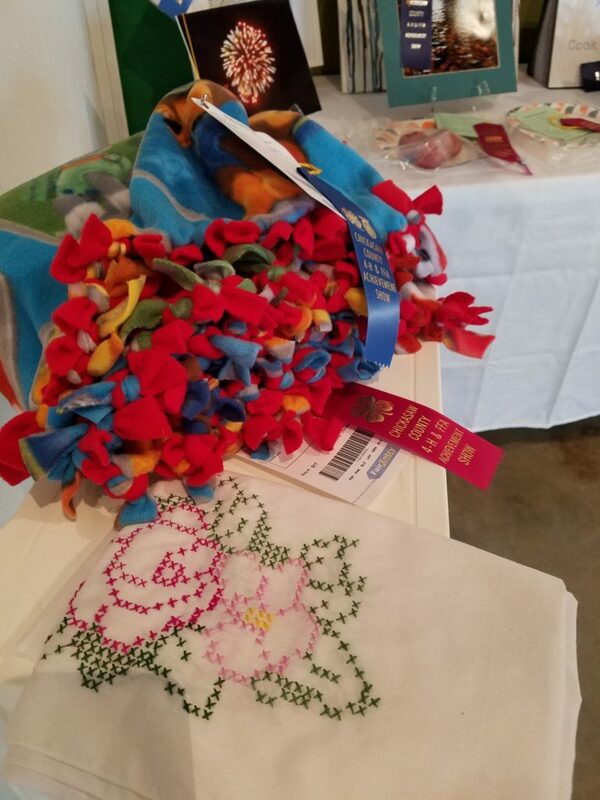 There are lots of sites and activities to take in, youth showcasing their projects, talents, animals, including cute bunnies, but I am most interested in the non-livestock projects which include sewing and needle arts. Here is a link to tell you more about it. 4-H Hot sheets. 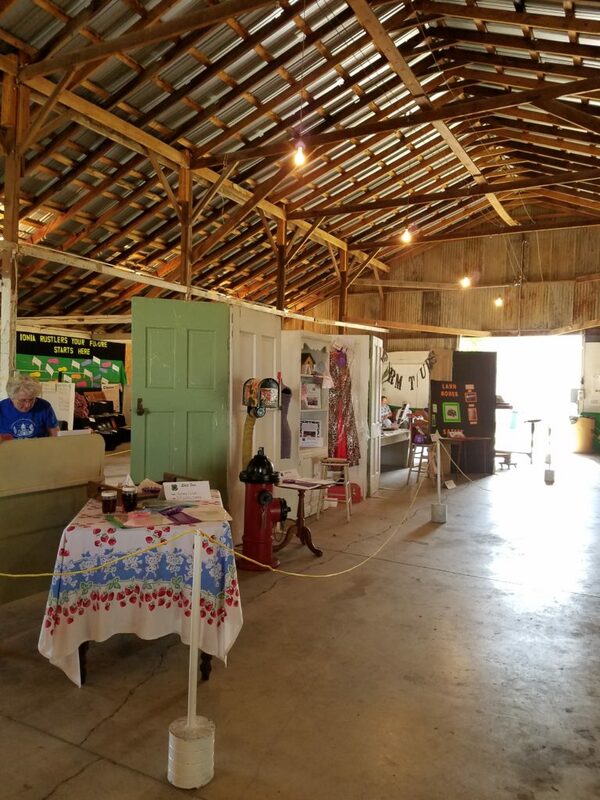 The show takes place in an old building, which is typical of our fairs in this area. Here you can see how it is set up. 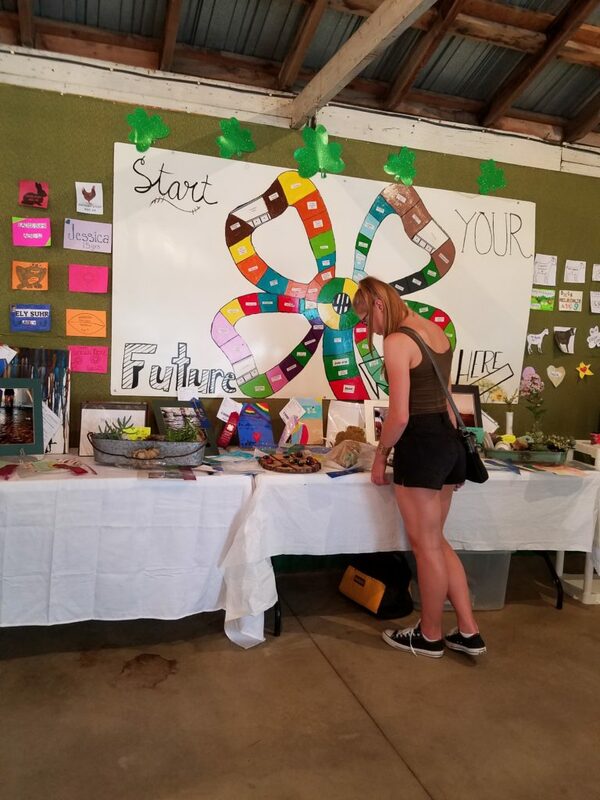 There are many 4-H clubs in each county that the youth can choose to join. They are able to select a club based on their interests and location. The clubs were named many years ago and I like that they have kept their names, some of the club names are; Ionia Rustler, Jolly Blue Bells, Utica Lucky 4’s, and Bradford Eager Beavers. If you are not from the area you are probably having a little laugh now, but around here we have grown up with these names and we love them! Each club then has their own “booth” as we call it, at the fair. Here is Gene Anne looking at the projects in one of them. 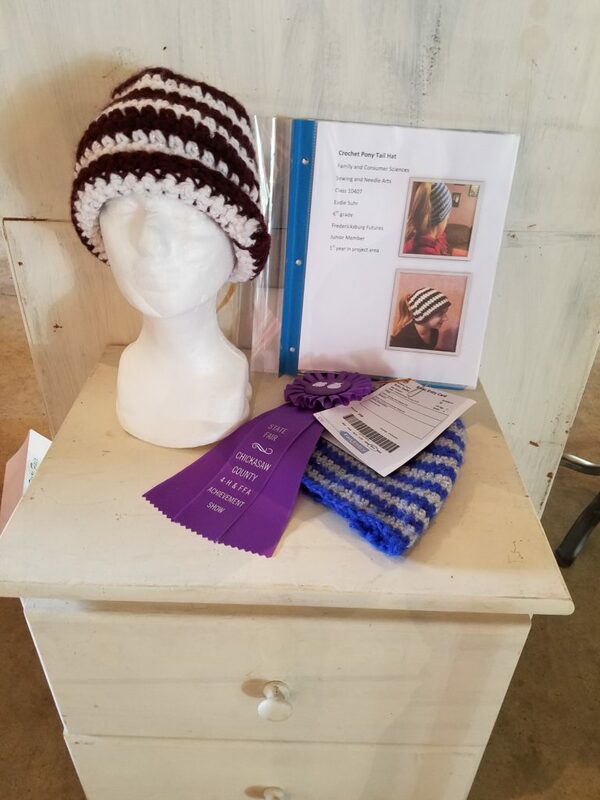 I was on the look out for the sewing projects and I really enjoy seeing what the youth have completed through the year, here is what I found. First was this lovely apron, who doesn’t love a hand made apron! The fabrics she chooses were so sweet- bees and flowers. 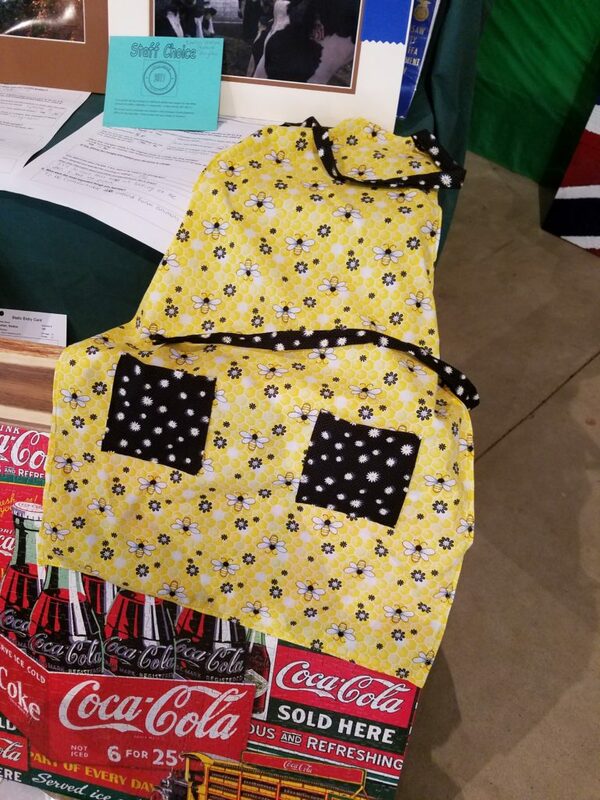 The apron was well constructed and the seams were finished, this young gal did a great job with her project A tie fleece blanket and a tablecloth with cross stitching was next. Each of these projects are unique and show the interests of each child. I was especially happy to see the cross stitch as many young people have never seen this, much less know how to make them. The stitches on this were clean and even. 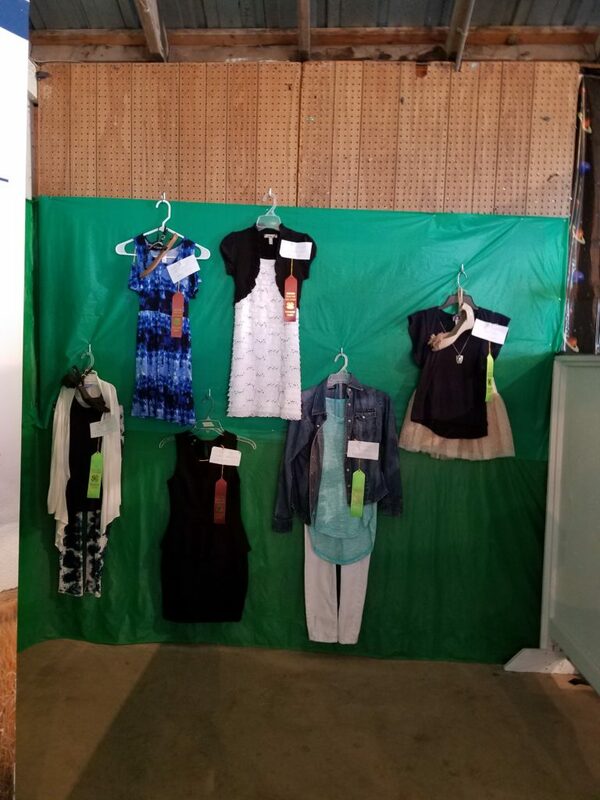 The youth can also bring clothing for different categories, these outfits represent the fashion review. This is where you bring an outfit of yours and you are judged on how it fits on you, how it looks on you, why you choose this, the cost of the outfit, and the fabric content, along with other guidelines. The county had a nice selection here. We also came across a beautiful pieced pillow case. Up close you can see the seams all match and the pillow case lays well, maybe this 4-H’er will make a quilt like this next year! Look at these adorable hats, and that this gal made them. I am not sure if this knitting or crocheting, if you know the difference leave a comment so next time I will know. These cute hats have a pony tail hole in the back for the hair to go through, what a great idea! Lastly, this was the only quilt in the entire building! 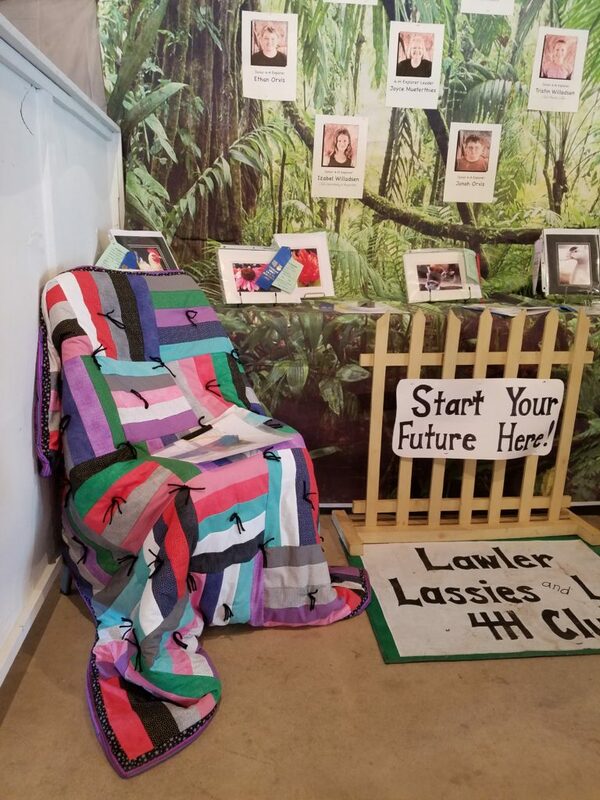 There has always been more in past years, but I know the number of youth involved in this program is decreasing through the years, but just one quilt? I would have been shocked if none were to be found and I understand this may be the case next year. 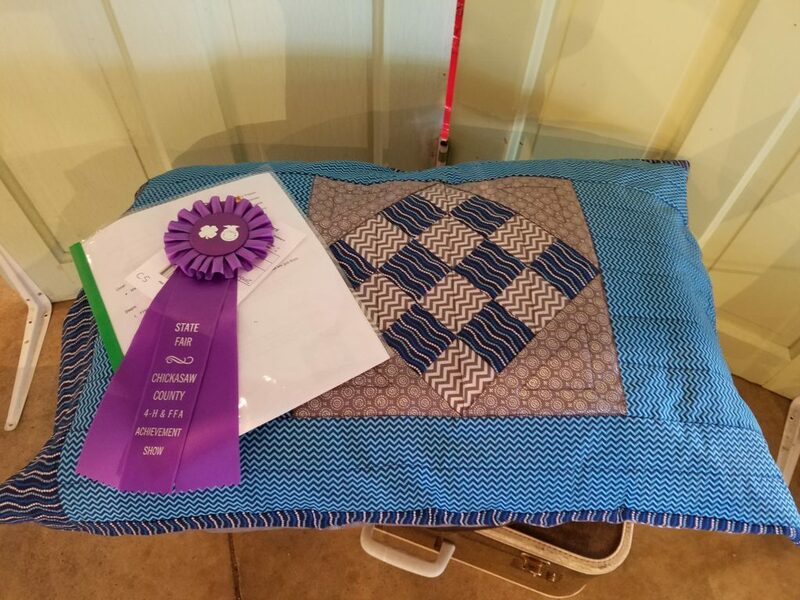 When our girls were in 4-H they each made one and often times two quilts to bring to the fair each year. Are we quilters partly to blame that we are not passing on our wonderful joy of quilting with our future generations? Is it a combination of less youth and different interests? I am not sure because I am a quilter and all of our daughters quilt. Overall, we had a very nice night! If you are a quilter, take time to actively engage our youth when it comes to quilting! We don’t want to lose this beautiful form of art. What are some ways we quilters can build interest around this? This entry was posted in Uncategorized on July 23, 2017 by Carla. I love seeing the needle point sewing projects. Even though the ‘Rose’ tablerunner had clear ‘x’s, I think it is considered embroidery. 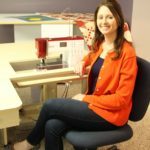 I have a few projects I could share with you. To me hand Embroidery is a lost art. Especially embroidered tea towels. The sewing projects were very cute. I am so glad you took the time to go. It seems like once we are done with our County Fair I am faired out for awhile. Thank you Melissa for sharing your knowledge on this. I miss being in 4-H, so I always enjoy going to see the projects! That is good she is cross stitching, how about a quilting video game, do they make those!? Sadly I think quilting is thought of as an “old ladies” hobby. I hear so many people say they didn’t start quilting until after they retired.